Ever watch Say Yes to the Dress and only see a few dresses that are only sort of close to your style? That show is great, but it doesn’t really cater to the offbeat bride. 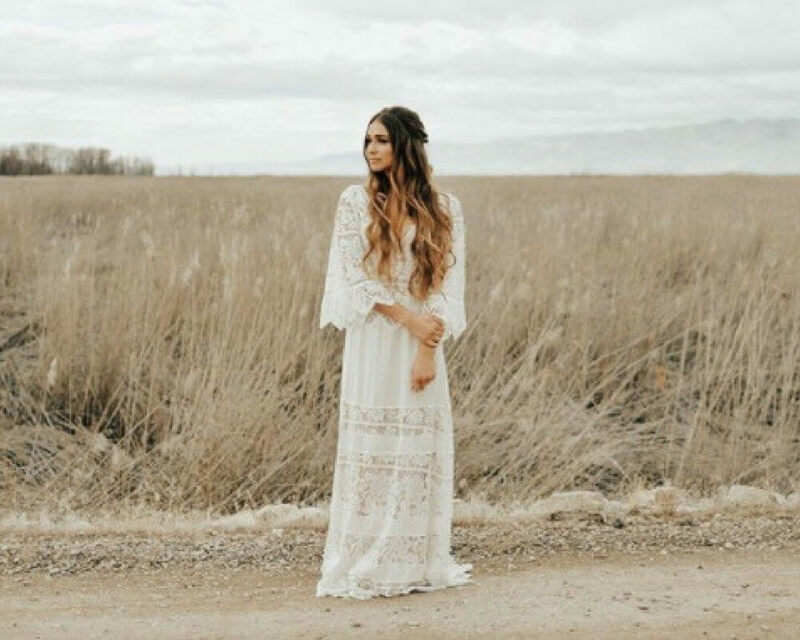 If you’re more into the boho aesthetic, this list is for you. Keep reading to see bell sleeves, all over lace, sheer skirts, and gorgeous back cutouts. The devil is definitely in the details, and these dresses are all about the details. 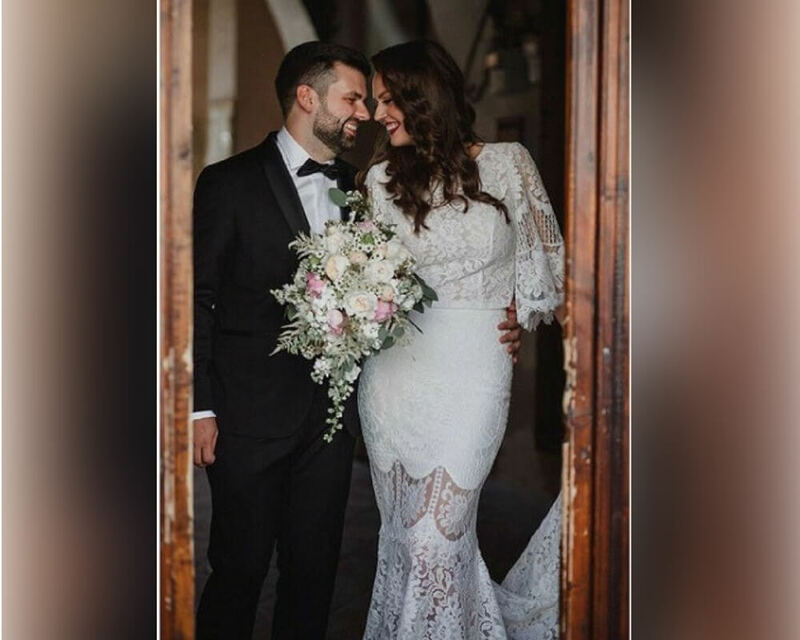 Check out real bride Andreea in Divine Atelier’s Alison Set. This dress features vintage lace, a high neck, and a flared sleeve lace bodice. The skirt is unlined from the mid-thigh down, and the pearl beaded neckline gives it some extra pizzaz. I especially love the long train and button back. BHLDN is Anthropologie’s bridal collection. They have tons of dresses at really affordable prices. This is the Monica gown. 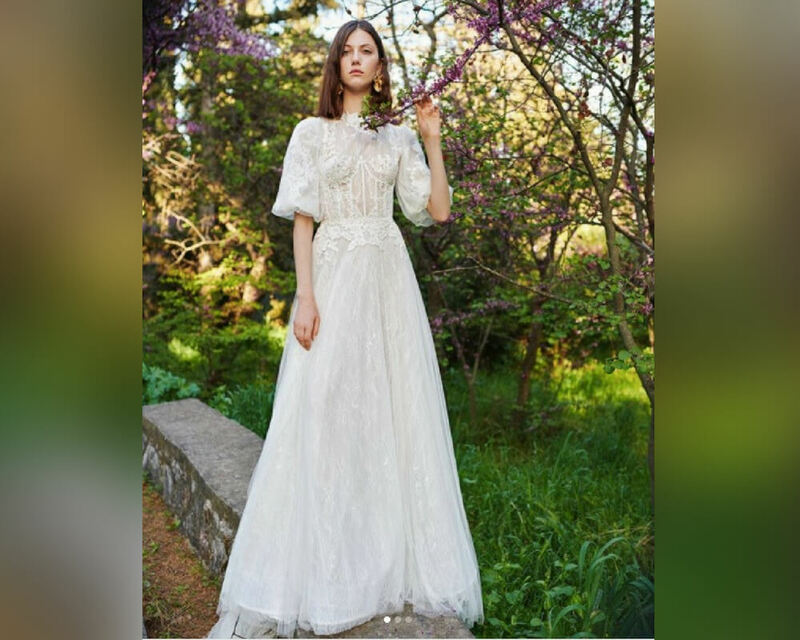 It’s one of the most expensive wedding dresses from BHLDN at $1,550. If that’s over your budget, you could always wait for one of BHLDN’s legendary sales. Christos Costarellos is the designer of my dreams. Everything he does is pure magic. It’s hard to find a Costarellos dress under $3,000, though. 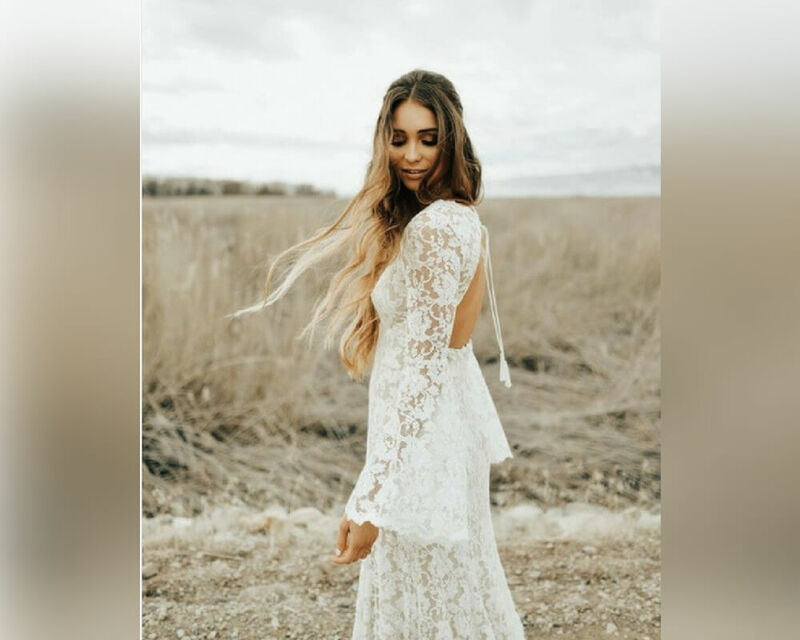 I guess that’s kind of a middle of the line price as far as wedding gowns go, but we bohemian brides like to be thrifty. 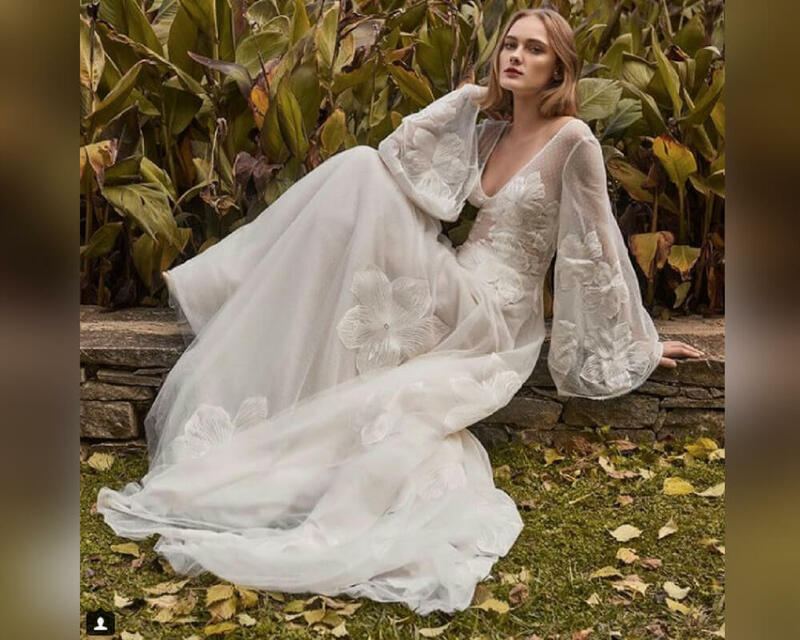 If Costarellos is out of your budget, let’s take a trip back to BHLDN. BHLDN is pronounced “beholden,” by the way. It’s just spelled without the vowels because they’re artsy. This is the Lucca gown. It has back cutout with tasseled ties, long bell sleeves, and a slight train complete the look. It costs $900. This is the Sage dress from Allure’s Wilderly collection. This is truly a dress for the dreamers. Sage is all things ethereal, with illusion lace bell sleeves and eyelash fringe. This would look great with a sash belt and a dramatic lace veil. 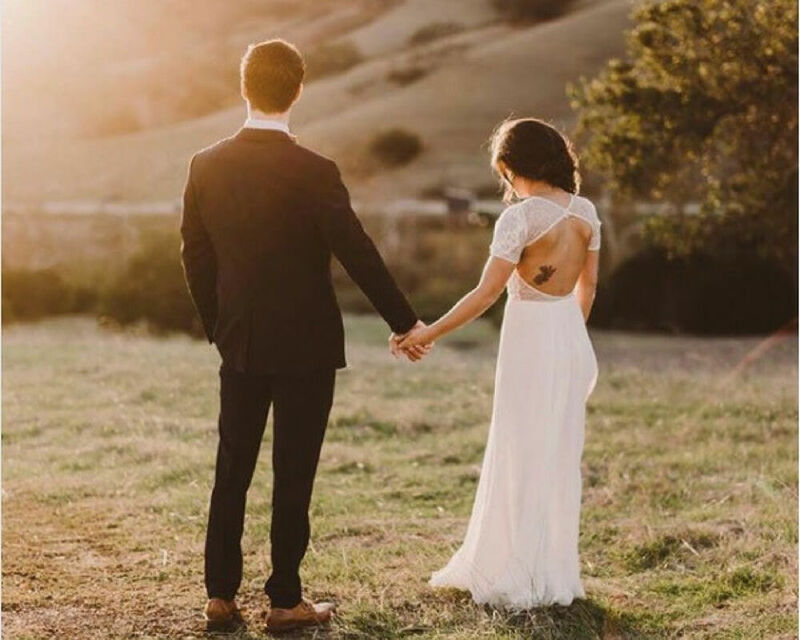 The Aspen Gown from BHLDN is the ultimate in style and comfort. The bonus? This dress is only $550. The sheer guipure lace in a whimsical floral motif accents this gown’s empire bodice, skirt, and wide bell sleeves. A v-neck and back lead to an A-line skirt finished with a scalloped hem. The Avril Gown from Ru De Seine is what dreams are made out of. 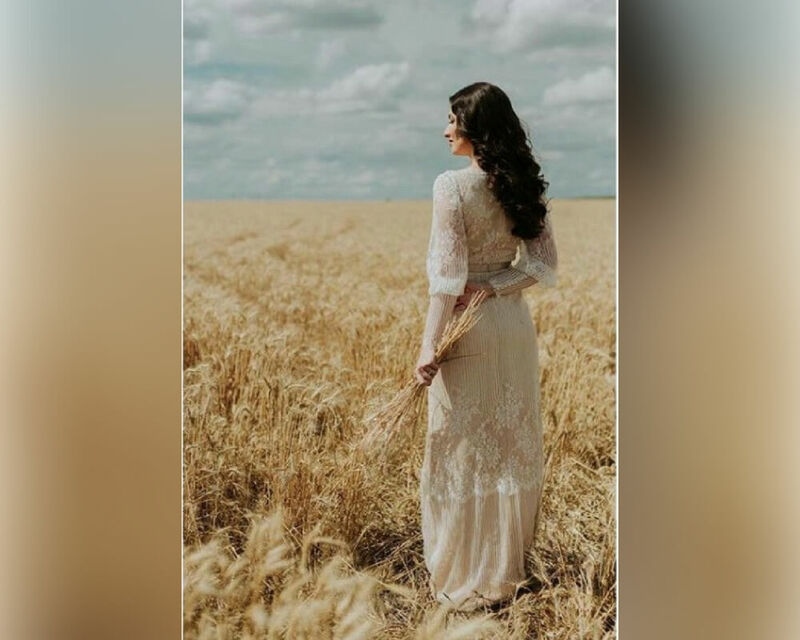 In this picture, it’s paired with vintage Cowboy boots for a marriage made in boho heaven. Ru De Seine has tons of gorgeous bohemian designs, but they cost a pretty penny. If your dress budget is a bit larger, they’re definitely worth checking out. Needle and Thread is a UK brand that has been knocking it out of the park for years. 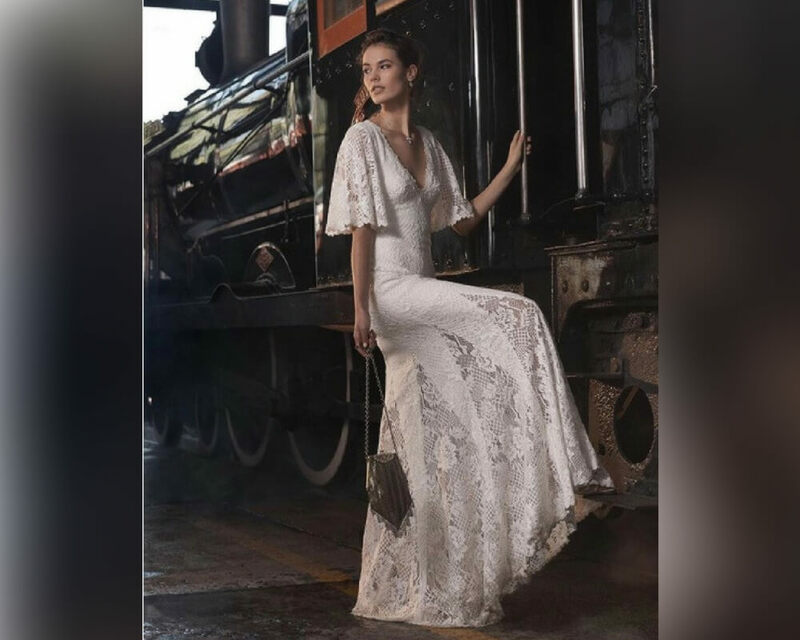 Their bridal collection is intricately designed and almost overly detailed. This is the Roses gown. It comes in two different colors, and it is knocking my socks off. This dress is now priced at £497.50, which is under 600 American dollars. Looking through Christos Costarellos’ bridal collection literally makes my heart jump. I could have put every single one of his dresses on this list, but I had to limit myself to just a few. This dress is a “v” neck ballgown with lace applique flowers and the most dramatic sleeves I’ve ever seen. This polka dot Costarellos dress is a real throwback. It’s not from his current collection, but that doesn’t matter because this dress is timeless. My whole body is swooning over this thing. How does this designer always nail it? Keep reading for just one more Costarellos dress. I saved the best for last. The Lani gown from Prea James Bridal is romantic and effortlessly stylish. 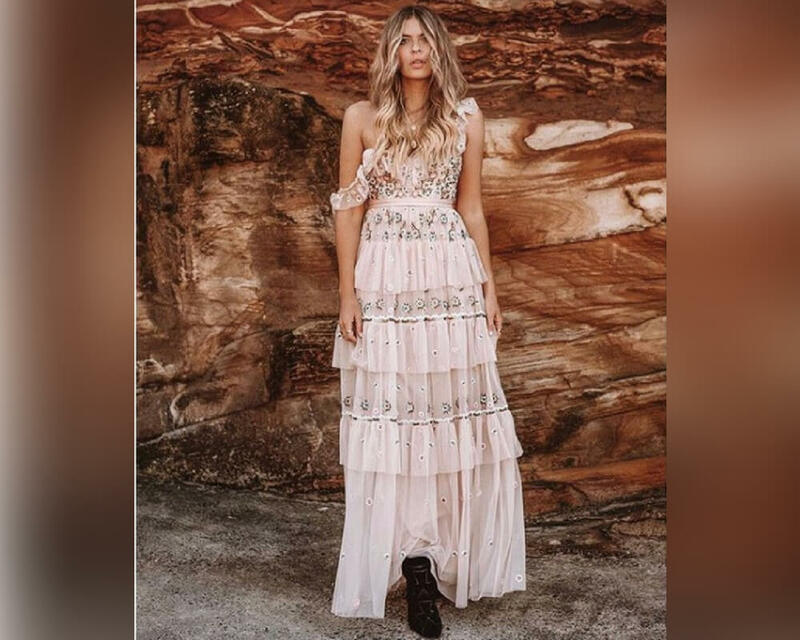 Prea James is an Australian designer who is doing this whole bohemian thing so, so right. The front neckline has a low squared V, with a seam running under the bust to accentuate and support. This dress costs $3,000. This dress is so unique it’s giving me heart palpitations. It’s romantic, retro, vintage, bohemian, and aristocratic all at the same time. My poor heart can’t take how beautiful this is. The backdrop of this photo is definitely adding to the aesthetic. This is a silk chiffon tiered dress with a mesh plunging neckline. There is not one thing that I would change about this dress. This ultra-flattering gown features illusion lace sleeves and a classic scooped back. It looks extra bohemian sitting on a peacock chair in the middle of the desert. This dress is under $2,500, and it’s stunning as heck. 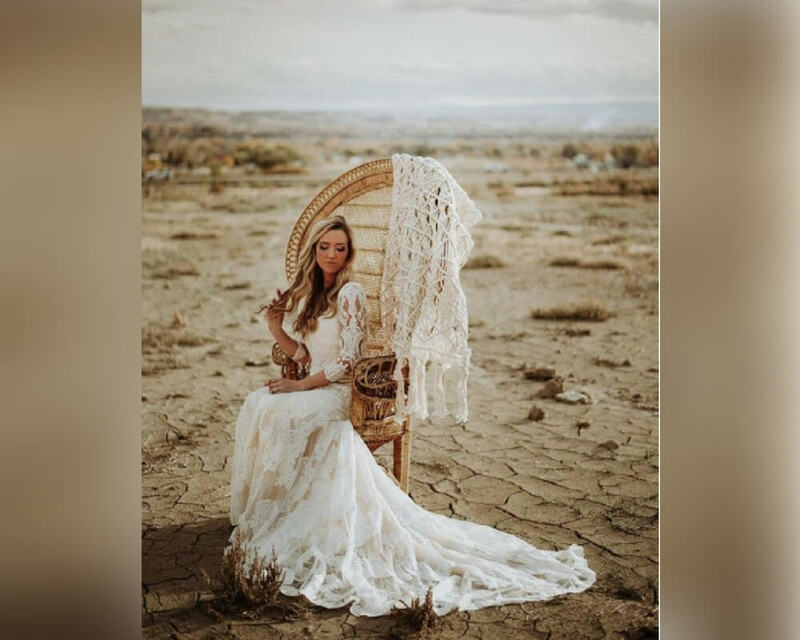 Keep reading to see a classic wedding gown with a bohemian twist. I don’t love the bottom of this Watters Xenia gown (just my opinion, don’t @ me), but the illusion back covered in intricate beading is everything. This fit-and-flare style gown is finished off with a full Soft Netting skirt. This dress is part of an assortment of limited edition gowns, so if you like it, you better act fast. This dress is for a bride who likes to step out of the box. It’s from Needle and Thread, but it’s not from their bridal collection (which means that the price is lower, FYI). The rose quartz color is super unique, and it’s fully decorated with a pretty ditsy floral and lace artwork. This is the Shiloh gown from Watters. It has a plunging Micah lace bodice with tulip sleeves over a dreamy washed Silk Organza skirt, finished off with a cotton satin sash and pearl buttons. It comes in two colors, and it is positively timeless. The Wild Harlow dress from Rue De Seine is a timeless wrap gown with an edge. It has a semi-fitted bodice, with beautiful sleeves that flare into dramatic bells from the elbow. This dress is universally flattering, and it’s full of surprises. Could the name Wild Harlow be any more bohemian? You didn’t think that we were done, did you? This Costarellos dress can be styled in so many different ways. 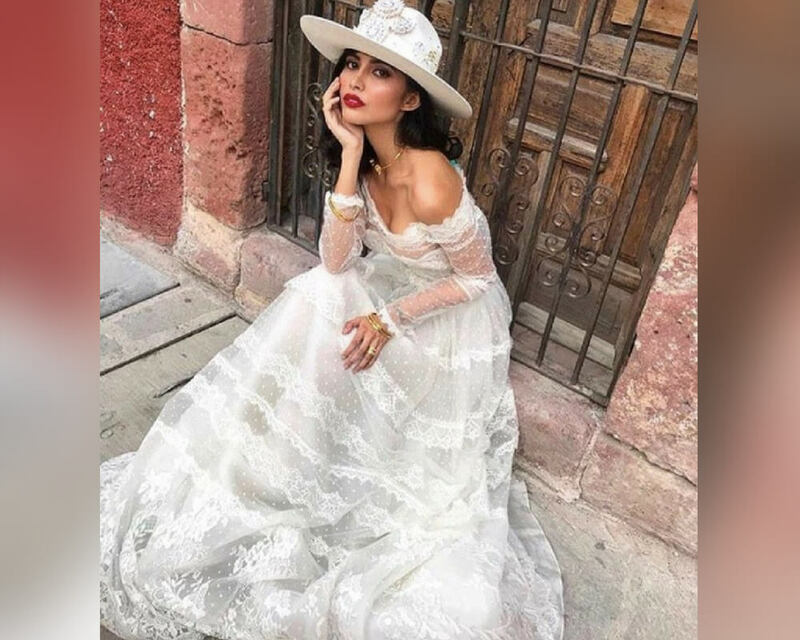 The white hat in this picture gives it a sort of mardi gras look, but you could easily style it with a long veil for something more bohemian. I can just imagine this gown in a gorgeous forest full of wildflowers. This is the Keiran gown from BHLDN. 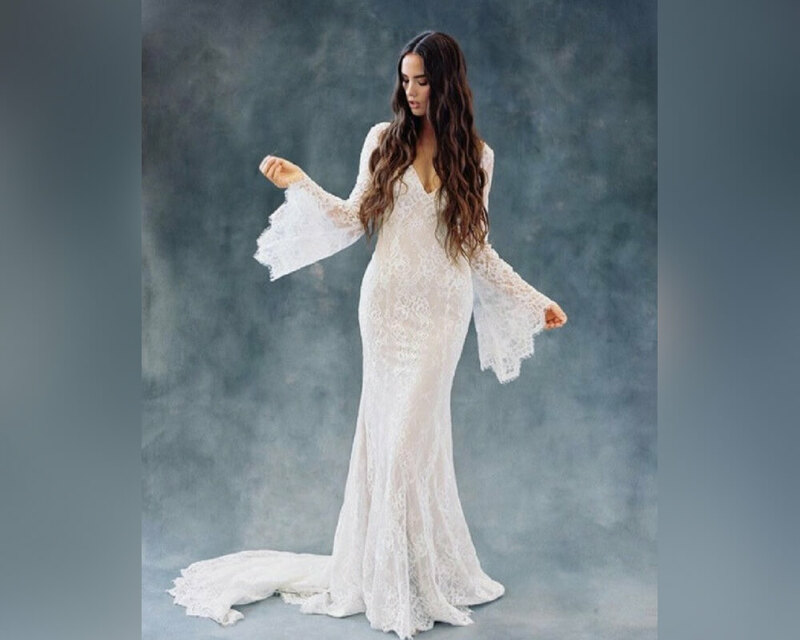 It has exaggerated flutter sleeves, a body-skimming silhouette, and sheer godet detailing on the skirt to give the dress its modern bohemian appeal. 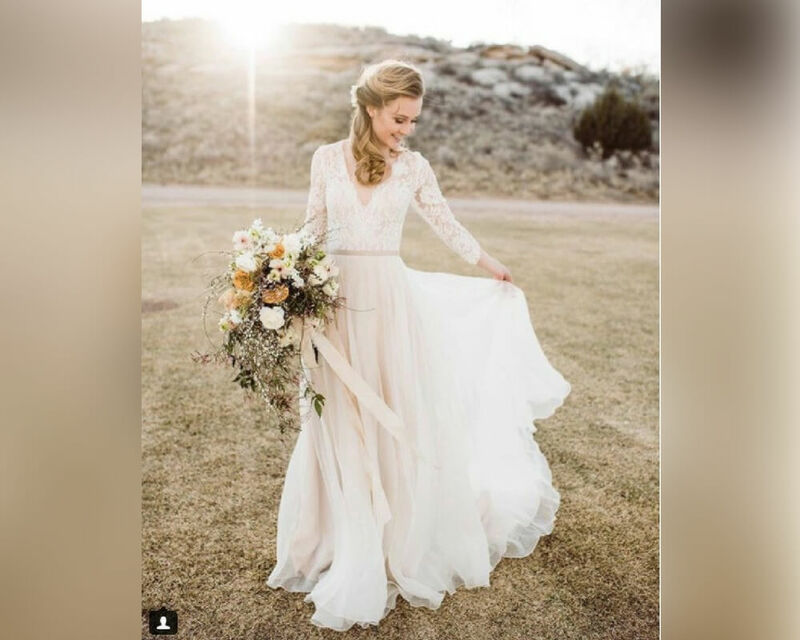 I haven’t been able to find many pictures of actual brides wearing this dress online. Hopefully, some will pop up this wedding season.